I asked John, the TL2 Scientific Director, how elephants could be disappearing from African forests and yet be considered so numerous that they are being legally “culled” out of some south African countries. The question, “Are African elephants two species”, is not new. The African forest elephant and the African savanna elephant look different. They are different sizes and their bones are different proportions, but they can hybridize. Recently the question of how different they are has become critical to conservation; we have also developed new ways to assess their separation. Species divisions matter to international law. They affect treaties such as CITES (the Convention on International Trade in Endangered Speices) and international assessments of species conservation priority, such as the IUCN Red Listing. Species divisions affect how all of us think about elephant poaching. Is a large and unique species — one of two species — rapidly disappearing? Or are African elephants — a single species — increasing in some areas, even if declining in others? New analyses of accumulated morphological, ecological and behavioral evidence strongly support the division of African elephants into two distinct species. Currently they are officially recognized only as sub-species: the forest elephant, Loxodonta africana cyclotis, occupies the tropical forest in the center of the continent, and the savanna elephant, Loxodonta africana africana, occupies a wide range of savanna, woodlands and even sub-desert. What is the new information? Divergence in the DNA contained in the cell nuclei of elephants confirms a deep evolutionary split between forest and savanna forms of more than 3 million years. The difference between the two African forms is equivalent to 58 % of the difference separating African and Asian elephants into two completely separate genera, Elephas (Asian) and Loxodonta (African). For African elephants, size matters and sometimes it pays to be small. Recent studies that evaluate both nuclear DNA, inherited from both parents, and mitochondrial DNA, inherited through the ovum along maternal lines, provide evidence for how the differences between forest and savanna elephants are maintained (see citation below). While nuclear DNA, with few exceptions, is specific to only one of the forms, mitochondrial DNA is more mixed with forest markers found in savanna elephants as far off as northern Botswana. A forest elephant enters an open mineral lick in the Ituri Forest. Photo by Reto Kuster. This suggests that while mating between forest and bush forms may occur, it is unidirectional, with larger savanna males occasionally mating with forest females. The smaller forest and hybrid males do not have access to savanna females. Over time, and repeated back crossing, nuclear DNA alleles unique to forest forms are progressively diluted. Mitochondrial DNA, on the other hand would not show this same trend, as their smaller size is not a disadvantage for hybrid female elephants. Why isn’t large size a reproductive boon for males in the forest as well? A large body is calorically expensive. In forest environments suitable food resources, in particular fruits, are widely dispersed. Female mates may also be separated over long distances making rapid long-distance travel more important. Large size is an impediment to movement through closed forest. At present morphologically hybrid elephants, with hybrid nuclear DNA are uncommon and restricted to a narrow ecotone belt where forest and savanna interdigitate. 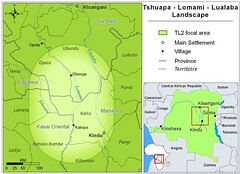 One such zone is Garamba National Park in DR Congo. Here the elephants themselves maintain the savanna ecotone by eating tree seedlings. 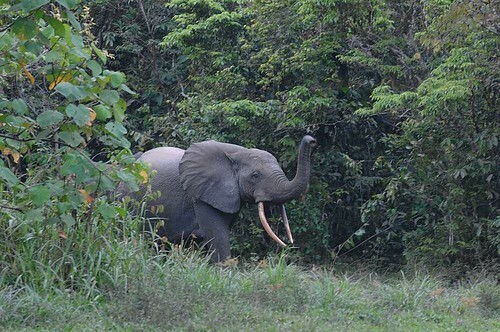 In Garamba, at least, it is an elephant maintained hybrid zone. Morphology and physiology Males smaller stature (< 2.5 m at shoulder) smaller skull, rounded ears and elongated lower jaw. Long and straightened tusks, stained dark brown on the outside. Fresh Ivory: hard with pinkish hue favored by carvers. Males larger stature (> 3 m at shoulder) Massive skull with high forehead, large fan-shaped eares, widened tooth row in foreshortened lower jaw. Prehensile “fingers” on trunk. Variable toe nails on feet. Stongly curved tusks, often not stained. Ivory softer. Ecology Closed tropical forests. Fruit a major component of diet. Significant role in seed dispersal. For some tree species, elephants are the only seed disperser. Wide range of open habitats, from moist to semi-arid. Diets dominated by browse from trees and shrubs. Grass a minor dietary component. Behavior Small female-based groups, possibly more rapid maturation than savanna elephants, at least in some populations Female based groups with large seasonal aggregations in some locations. Major movements oriented to seasonal food and water. Elephant Species question in the conservation context. African elephants should not be treated as a single form in terms of their conservation. Savanna elephant populations in many areas are rising. In some countries they are being “reduced” to prevent degradation of their remaining range. Stocks of ivory from culled elephants have accumulated, and governments want to sell the ivory to pay the costs of elephant management. In Central Africa, meanwhile, the range of the forest elephant is shrinking and elephants remain vulnerable to heavy poaching. In these countries, any opening of the ivory trade is one more threat to the region’s dwindling elephants. These differences have led to controversy at CITES and other gatherings over the last decade. The rancor shows no sign of diminishing. Classification of Africa’s elephants into two species might offer some resolution. True, poachers and ivory buyers will not be taxonomically circumspect in their dealings. After all, the forest ivory is preferred. Nevertheless, confirmation of the specific status of forest and savanna elephants might help raise funds for what is a critical situation in Central Africa. The fate of elephants is now inextricably in the hands of humans. Elephants won’t survive by slipping through the cracks. This entry was written by Terese Hart, posted on 2008-11-15 at 11:10 pm, filed under Elephant. Bookmark the permalink. Follow any comments here with the RSS feed for this post. Post a comment or leave a trackback: Trackback URL. All African elephants are now in danger, with CITES’s incredibly irresponsible decision to allow China to buy ivory at the one-off sales over the last two weeks. Although CITES maintains there is no relation between the sales and poaching, reports from on the ground all say that poaching is increasing wildly. We cannot assume an elephants are safe. Also — as to elephant populations rising in some areas: elephants are being crowded into smaller and smaller areas by humans. Culling is a short-term “solution” that may actually have the opposite effect in the long term. Other alternatives — such as opening corridors so elephants can migrate — must be considered. Although it’s easy to call this a conservation problem, we must look at it in the larger context. How will it affect the economies of African countries if all the wildlife disappears and tourists stop coming? I agree. Culling is a highly partisan maneuver. But the possibility of eventual tourism won’t be what saves forest elephants, not in DR Congo where there is now almost no tourism but more than 50% of Africa’s forest. There has to be a strong, specific call to save forest elephants and, in DR Congo at least, an all forest, village-level campaign. Absolutely. I apologize if it sounded like I was suggesting any kind of solution imposed from the outside. The initiatives have to come from the people who live with wildlife. I had always thought the vastness and (relative) inaccessibility of the lowland forests would protect them. We do have something of a (savanna) elephant overpopulation problem in our reserves in South Africa. What to do (if anything) about the issue is controversial. Recently, artificial contraception has been introduced to slow the pop growth rates in various reserves. (see e.g. various papers in SA Journal of Science, Sept/Oct 2006 for lengthy discussion on these and related matters: “A scientific perspective on the management of elephants in the Kruger National Park and elsewhere”). Incidentally, what is the status of Garamba NP these days? Are the Smiths still there? I presume the rhinos have been finally extirpated, or do they still cling on? Amy, although to change the situation a real ground presence is needed — external lobbying is critical both to affect global policies and to affect what is funded. Greg, the Smiths are no longer in Garamba although Kes continues to collaborate. It is a SoAfr group! African Parks Foundation. I am not certain if it is official that the northern white rhino is extirpated in the wild (?) but there were, I believe, only 4 found on a very thorough aerial census quite a while ago. Terese — I’ll look forward to your post. I think most people assume the elephant population boom in South Africa is the norm for all African countries. All the coverage of the true situation is in Africa and Europe; here in the States it hasn’t registered, except for National Geo. And most of the conservation/wildlife groups have been silent. It’s frustrating and heartbreaking. Yes, Frustrating and Heartbreaking. Alas. andrea turkalo. very interesting but also very depressing. So glad that Andrea is still at Dzanga — and I left a comment on her Sept post. I totally agree with Andrea! There needs to be an outcry — for starters, what about targeted to CITES for its decision to allow China to buy ivory? CITES insists there’s no relationship between ivory sales and poaching, and yet all recent reports from the ground are that poaching is booming. And what about scientists and researchers? Iain Douglas-Hamilton/Save the Elephants and Richard Leakey have spoken out — that’s a start. But so much more is needed. And the wildlife/conservation groups — why aren’t they speaking out? I just visited the CITES contact site. I still think that it is very reasonable to write to CITES. The power of numbers, the impact of lobby : extremely important.